A Michael Jackson hologram took the stage at the Billboard Music Awards -- drawing mixed reactions from the crowd and the social media sphere. Was it a fitting homage to the King of Pop? Or did it exploit the late singer's memory and legacy? That's not the only thing that got people talking this past week. 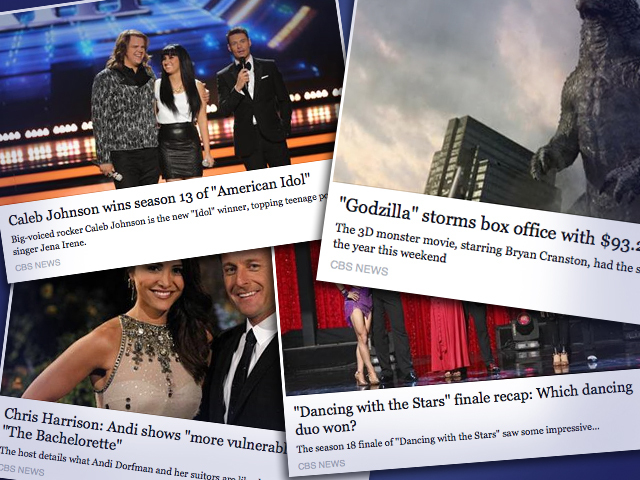 A certain monster trounced the box office competition, a new couple was crowned champions on "Dancing with the Stars" and Andi Dorfman began her stint as "The Bachelorette." 2. "Godzilla" tops box office on opening weekend in the U.S.
"Godzilla" had a monstrous weekend at the box office, taking in $93.2 million in its opening weekend. That's enough to make it the second-largest debut of the year (the first, if you're wondering, is "Captain America: The Winter Soldier," with $95 million in April). Have you seen the film? 3. Maks and Meryl win on "Dancing with the Stars"
The 18th season of "Dancing with the Stars" came to an end this week by crowning a new set of champions - and the winners were ice dancer Meryl Davis and Maksim Chmerkovskiy. So now Davis has an Olympic gold medal and a mirror ball trophy to her name -- not too shabby. As for Chmerkovskiy, he said he probably won't return to the hit ABC show. 4. Aleyda Ortiz is crowned in "Nuestra Belleza Latina"
"American Idol," "Dancing with the Stars" and "The Voice" weren't the only competitions to finish up this week -- the Univision beauty contest "Nuestra Belleza Latina" also crowned its winner. But Aleyda Ortiz's win has sparked some controversy, as many questioned whether another contestant (Josephine Ochoa) deserved to win instead. In response, Univision responded to the claims and explained the voting process to the Latin Times, confirming that Ortiz's win was in fact correct. Post by Nuestra Belleza Latina. "American Idol" has a new winner -- and it's big-voiced rocker Caleb Johnson. The 23-year-old from Asheville, N.C., beat out 17-year-old singer Jena Irene for the audience-voted honor. The "Idol" finale also included performances by John Legend, Kiss, Demi Lovato and Lady Antebellum. It also showcased a song by judges Jennifer Lopez, Keith Urban and Harry Connick Jr., with judge-turned-mentor Randy Jackson joining in. The show will be back for another season next year, but reportedly in a scaled-down, revamped format. Andi Dorfman's tenure as "The Bachelorette" began Monday night in an episode filled with awkward limo exits, lamp-stealing (seriously? ), terrible pick-up lines and a would-be party-crasher in the form of former contestant Chris Bukowski, who showed up asking to meet with Andi and join the show only to be shot down and escorted away. He claims this whole thing was staged, but whether it was or wasn't, we were certainly watching. 7. Josh Kaufman and Usher win on "The Voice"
Team Usher nabbed its first win this week when soulful rocker Josh Kaufman was crowned champion on season 6 of "The Voice." Blake Shelton's country singer Jake Worthington came in second place, and singer-songwriter Christina Grimmie from Adam Levine's team took third. Coldplay, Ed Sheeran, OneRepublic, Tim McGraw and Robin Thicke also performed during the finale. Fans marked what would have been the 42nd birthday for Christopher Wallace -- better known as the rapper Notorious B.I.G. or Biggie Smalls -- on Wednesday, May 21. He was killed by an unknown assailant in a drive-by shooting in Los Angeles on March 9, 1997, when he was just 24 years old. Post by The Notorious B.I.G. Andy Samberg returned to "Saturday Night Live" for the first time since departing the show two years ago, and brought a few other famous friends along with him (Nice to see you, Maya Rudolph! Oh hey, Fred Armisen, Kristen Wiig, Bill Hader, Seth Meyers and Paul Rudd!). Singer St. Vincent also earned praise as the night's musical guest. Did you notice the synchronized moves she did with her band while singing? Pretty neat. Warner Bros. officially announced this week that the "Man of Steel" sequel will be called "Batman v Superman: Dawn of Justice." If that wasn't enough to get superhero movie fans excited, artwork for the film was also unveiled. Fittingly, it's a mashup of Batman and Superman's logos. Post by Batman v Superman: Dawn of Justice. *Buzz rankings reflect the top entertainment topics being discussed on Facebook, May 18-21, in the United States. Rankings are based on both frequency and momentum: the Facebook conversations that not only got a lot of buzz during the week, but also saw a notable increase compared with the previous week.